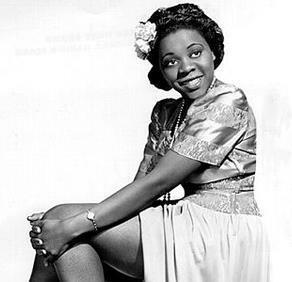 December 14, 1963 Dinah Washington, blues and jazz singer, died. Washington was born Ruth Lee Jones on August 29, 1924 in Tuscaloosa, Alabama. As a child, Washington played the piano and directed her church choir and by 16 she was touring the United States on the black gospel circuit. During this period, she performed in clubs as Dinah Washington while performing as Ruth Jones on the gospel circuit. The Rock and Roll Hall of Fame listed “Am I Asking Too Much” (1948) as one of the 500 Songs That Shaped Rock and Roll. In 1993, Washington was posthumously inducted into the Rock and Roll Hall of Fame and the United States Postal Service issued a commemorative postage stamp in her honor. In 2008, the city of Tuscaloosa renamed a section of 30th Avenue Dinah Washington Avenue. Her biography, “Queen of the Blues: A Biography of Dinah Washington,” was published in 1987.